Work has been especially stressful lately, so I was especially happy this past weekend to have a quilting retreat scheduled with some of my friends from the office. We tried a new location this time, much closer than the place we’d been going in recent years. It still felt secluded, with the house set way back from the road on a 10 acre plot in the countryside north of the tri-county area that makes up what I think of as metro Detroit. 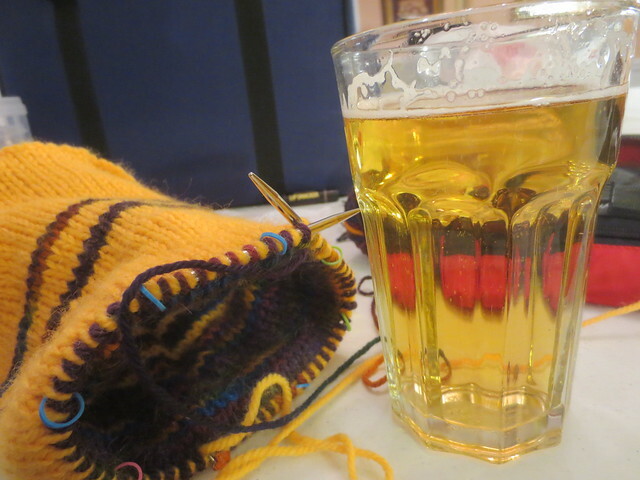 I took Friday afternoon off, and even though I didn’t escape as early as I’d hoped, by 4:30 I was relaxing at my place in the big workroom with a hard cider and my knitting (other crafts are welcome at our quilting retreats), having stopped along the way to shop for my contribution to the massive amount of food and drink we always end up regardless of how much planning we try to do about who is bringing which meals and snacks. I didn’t have a chance to prepare any new projects for this retreat, but the supplies for my paper pieced scrap blocks were still packed up from last year, so I grabbed those to bring (it really wouldn’t be a retreat without them anyway). I’d envisioned just sewing more squares from strips, but in unpacking my supplies on Saturday morning, I came across the little sketch I’d done of a quilt design using these blocks and decided to see if I had enough done to make a reasonably sized quilt from that sketch. I did, so went to lay out blocks on a table to see how they would look together. One of the ladies wandered by to see what I was up to and made a suggestion that improved the overall quilt design and soon I was sewing. 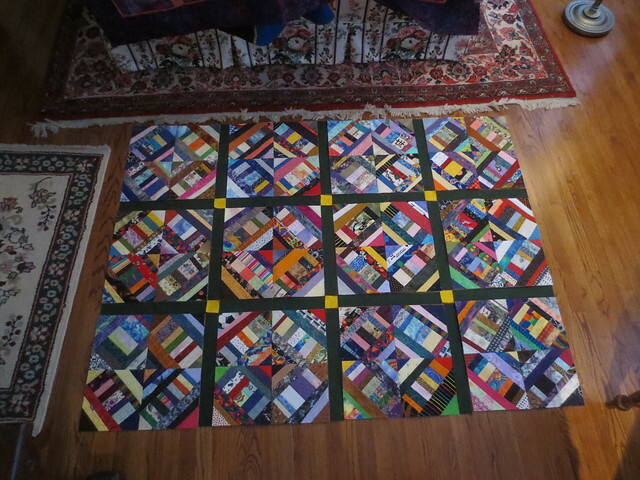 Since I hadn’t planned to make a quilt top, I hadn’t brought any yardage for sashing or borders, so joining the ladies who were heading to the quilt shop in a nearby town seemed not just fun but necessary. I found what I was looking for in the shop and a few more fabrics I hadn’t been looking for but decided to get because a 60% off sale is a sign from the universe. Back at the retreat house, I ironed and cut the unwashed fabric (I have never knowingly used unwashed fabric in a quilt before but there’s a first time for everything) into sashing strips and cornerstones and laid them out between the block units. Then I sewed and sewed and sewed until I had the whole top together. After that, I began the tedious task of removing the paper foundations from all those blocks. It’s very tedious indeed, but has to be done. We stayed up late working on our projects and talking and laughing. I finally got too tired and went up to bed. Poking around on my phone before turning it off for the night, I saw a winter storm warning posted. Normally, I’d have just ignored it, figuring we had plenty of food and it might not be so bad to be snowed in at a retreat house with friends, but on this particular weekend, I definitely didn’t want to be snowed in, as I was scheduled to pick Mr. Karen up at the airport Sunday afternoon—he’d been in India for work for two weeks and we hadn’t talked the entire time, just been able to exchange a few emails what with the 11 and a half hour time difference and how busy we both are. I spent a few minutes studying the weather radar and the hourly forecasts for both the town we were in and the city the airport is in, and thought about how long the driveway at the retreat house is, and how it slopes up to an unpaved road where it’s hard to see if the way is clear, and how we’d slipped a bit getting up that drive when we’d gone out to the quilt shop, and decided to get up, get dressed, and slip away from the retreat like a thief in the night. Well, not quite. A few of the ladies were still up when I went back downstairs to share my plan. One in particular was very supportive. One gave me her car keys in case she was blocking my car. One seemed to think I was being kind of a wimp but didn’t come right out and say that directly. In short order, I was packed up, car loaded, and heading off into the night (early morning, actually). I stopped to get gas so there would be no way I’d run out even if I got stranded in a snowbank for several hours , not that there were any snowbanks to speak of at this point. I knew I was heading into the leading edge of the storm, so wasn’t too surprised when I saw my first flakes about 10 miles from home, with the roads getting more and more snow covered and slippery by the minute. As soon as I stopped the car, I texted one of the quilting ladies to let them know I’d made it okay, then when I headed down the driveway to get the mail that had arrived while I was gone, slipped and fell on my wrist and hip. Shouldn’t have let my guard down so soon, I guess, but no real harm done. I slept what felt like a few minutes in my own bed, then monitored Mr. Karen’s flight’s progress and travel times on the freeway so I’d know when it was time to shovel my way out of the driveway (about six inches had fallen at that point). It was a slow trip to the airport but I made it to the parking garage just about the same time as the plane landed, leaving me plenty of time to get in position outside the doors from the customs and immigration area. The drive home was better even though the snow was still coming down, because I had my man back with me, of course, but also because the plows had been out on the freeway. This morning, I shoveled again so I could get out of the driveway (yeah, that service we hired doesn’t do so well with getting done before folks have to go to work). I was prepared to turn around and work from home if the main roads were bad, but they were passable, and lots of folks did stay home, so it only took me 70 minutes instead of my usual 60 to reach the office. Apparently this is the biggest winter storm Detroit has had in 40 years, but it doesn’t feel like it was that severe, maybe because today it’s been bright and sunny. Glad you stayed safe! The quilt top is stunning.